The all-new Ford Transit Custom takes the Transit family in a new design direction with a stylish and contemporary appearance that extends its appeal to a new generation of one-tonne van customers. 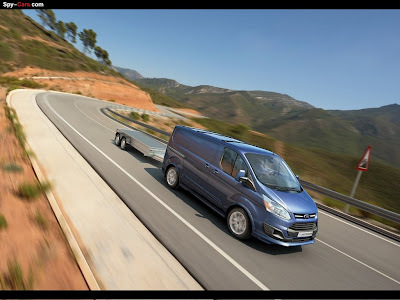 With its advanced, streamlined design, the new vehicle embodies the same dynamic character as Ford's kinetic design passenger cars, but without compromising its exceptional load-carrying ability that is a trademark of the Transit brand. "The new Transit Custom looks like no Transit before, with a bold new design which has a distinctively modern and sporty feel," said Paul Campbell, Commercial Vehicle Chief Designer, Ford of Europe. "Customers in this segment told us they want a vehicle that they are proud to have on their driveway, and we have given them exactly that." The all-new Ford Transit Custom immediately announces its arrival with a dramatic new exterior which, for the first time on an all-new commercial vehicle, shares design cues with Ford's latest family of kinetic design cars. "One look at the bold trapezoidal lower grille, and the large swept-back headlamps that flow into the muscular rising shoulder line tells you that this is a very new kind of Transit. The vehicle's sportier stance and more dynamic character make a powerful new impact. "By giving the front end a more curved, 3D appearance in plan view, and by subtly increasing the 'tumblehome' of the upper body sides, we have created a design which is visually much more compact and stylish, but which retains superb space and practicality," Campbell added. The combination of increased style and maximum functionality is repeated at the rear of the vehicle, where the highly distinctive elevated rear light design offers a clean and modern look and very good visibility with the widest possible rear door width. 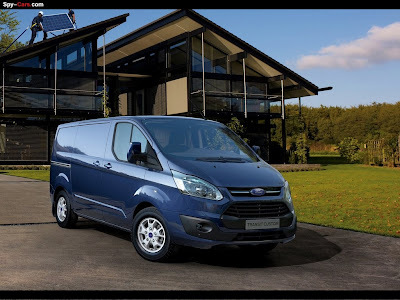 Throughout the vehicle, Ford designers and craftsmanship specialists have worked together to ensure that the new Transit Custom not only looks stylish and modern, but that it delivers a superbly crafted finish, too. The attention to design details can be seen in every element of the vehicle, from the chamfered corners on the top and bottom of the windscreen, to the precise execution of the lower body sides and rocker panels. "Many long-time Transit customers might recognise the signature 'shark's fin' kick-up in the front window line, which is echoed in the rear body panel. We also went to great lengths to minimise the number of shutlines on the vehicle, for a cleaner and more contemporary look," said Campbell. The superior craftsmanship has been delivered by an intense focus on the fit and finish quality of every exterior component. This is reflected in car-like joint conditions throughout the body, with tighter shutlines, sharper radii and better fits, such as where the front bumper facia meets the front fender sheet metal. Ford's designers have been determined to ensure that the new Transit Custom is not only very good looking, but practical as well. "Despite the far more dynamic and less boxy appearance, the new model still provides class-leading loadspace. We have also retained very practical door openings, including the largest sliding side door opening in the class," Campbell said. Another good example of practicality is found in the execution of side mirrors. Stylish and more aerodynamic, the mirrors integrate the turn signal repeater within the mounting arm, rather than in the mirror, so that if the outside of the mirror gets broken in an impact, the indicator parts do not need to be replaced. Also, due to its positioning the repeater remains fully visible. This same approach is also seen throughout the design, such as on the front and rear bumpers, where all expensive parts which might be damaged in inner city driving are positioned "out of reach" for maximum protection and breakage avoidance. The front-end design has also been carefully optimised in line with pedestrian protection requirements, including full consideration of the new Euro NCAP Heavy Vehicle pedestrian protection protocol. The all-new Ford Transit Custom brings a new level of driver appeal to the one-tonne class with a stylish, car-like interior which combines enhanced comfort, outstanding everyday practicality and superior craftsmanship. 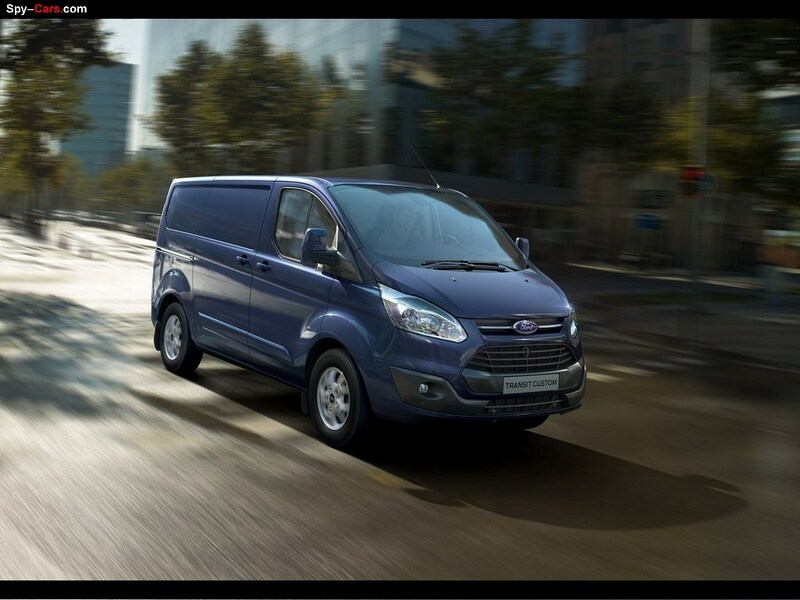 Combined with the new model's improved refinement and more supple ride, this makes the Ford Transit Custom's cab a comfortable place to spend a long working day behind the wheel. "Customers in this segment told us they are looking for a comfortable, car-like environment, with the ability to serve as a mobile office when required," said Ulf Roentgen, interior design manager, Ford of Europe. "In Transit Custom, we have given them a modern, driver-focused cockpit which combines stylish looks and generous space with a host of smart stowage areas." The interior design of the Ford Transit Custom is stylish and modern, adopting the more expressive design language found in Ford's latest kinetic design passenger cars. "We wanted to give the interior a really car-like, driver-focused feel, with the characteristic sculpted shapes and bold graphics which are key elements of kinetic design. Features like the distinctive trapezoidal shapes of the instrument binnacle and the wing-like form of the instrument panel give the cockpit a unique and very contemporary appearance. "We weren't prepared to compromise functionality, however, and made sure that design met the needs of a practical workspace and was packed full of useful stowage features," added Roentgen. To complement the more stylish design, the interior was developed with a rigorous focus on quality and craftsmanship, to ensure that the cabin materials combined typical Transit durability and toughness with a more premium, car-like appearance. Throughout the cabin, the fit and finish of components has been significantly improved. The choice and execution of materials follows the practices used on Ford's latest passenger cars, with distinctive accents used to highlight design details, yet offering good durability to withstand day-to-day working challenges. An example of the superior material quality is found in the instrument panel, which uses a specially developed modern synthetic material with a soft feel and a sophisticated grain pattern designed to match leather used in Ford's car lines. This material combines low gloss levels, creating a perception of softness, with outstanding durability and resistance to marking. Designed for outstanding practicality, the Ford Transit Custom interior satisfies the needs of customers who use the vehicle as their everyday working environment. With its dash-mounted gear lever, the interior provides excellent cross-cab access for driver and passengers. All of the interior materials have undergone extensive lab testing to ensure that they are functional, durable and easy to clean. The vinyl floor covering, for example, features a grain pattern specifically chosen to minimise soiling and allow simple cleaning. Driver comfort on the Ford Transit Custom is significantly enhanced through a highly adjustable driving position which features increased seat travel - including 30mm more rear travel for taller drivers - and the addition of a steering column adjustable for reach and rake. The steering wheel itself is positioned at a more vertical, car-like angle. The front seats are brand new, and are designed to deliver superior all-day comfort, more efficient adjustment and a more car-like appearance. The cockpit has a driver-focused design, with improved ergonomics which have been developed following the same Human Machine Interface approach as Ford's recent passenger cars. The reach to major controls such the gear lever, climate system and audio system have all been significantly improved. The driving position has a command bridge feel with excellent visibility - the Ford Transit Custom has the largest clear windscreen glass area of any vehicle in its class. The all-new Ford Transit Custom brings new levels of driving dynamics to the one-tonne class, combining car-like ride and handling with outstanding stability and control both when it's loaded and unloaded. To achieve this new level of driver appeal, Ford's acclaimed vehicle dynamics team took the same fun-to-drive DNA that has become a core characteristic of Ford passenger cars, and applied it to the new vehicle. 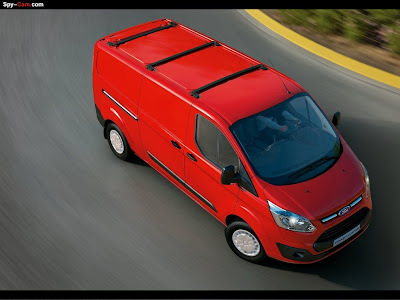 The significant step forward in dynamics was achieved through meticulous tuning and re-engineering of the suspension and chassis components, working together with the Ford Transit Custom's optimised body structure, which is as much as 37 percent stiffer than the equivalent current Transit. "We wanted to give our van customers the same confident, easy-to-drive feel enjoyed by Ford car drivers," said Philippe Castro, CV vehicle dynamics supervisor, Ford of Europe. "Using tuning lessons learned from our latest cars, combined with intelligent chassis engineering, we have delivered a van that really does provide a car-like experience behind the wheel." A primary objective for the new model was to make the steering more connected and more precise, while at the same time providing reduced steering efforts - particularly at parking speeds - along with better feedback through the wheel. The dynamics team also wanted to give the Ford Transit Custom more stable and balanced handling in all load conditions, with improved grip on surfaces ranging from dry tarmac to ice and snow. This would include exploiting the latest Electronic Stability Program technology, including a Torque Vectoring Control feature similar to that on the new Ford Focus. To complement the more car-like steering and handling, every aspect of the driving experience - from the brake feel, to the gearshift movement, and the response of the engine to the accelerator - have all been carefully tuned to provide a consistent and harmonious feel, making the vehicle enjoyable, comfortable and safe to drive. For improved comfort during long days behind the wheel, the Ford Transit Custom has been developed to deliver significantly enhanced ride performance with improved plushness, a reduction in impact harshness and vibration, and better controlled body motions. The suspension - front MacPherson struts with variable rate springs, and rear leaf springs - has been re-engineered with significantly softer spring rates (up to 30 percent softer), increased front wheel travel, optimised suspension bushes, and gas-pressurised dampers that adopt the tuning strategy developed for Ford's passenger cars. The performance of the suspension is based on the Ford Transit Custom's much stiffer body structure - with torsional stiffness increased by up to 37 percent, depending on version - as well as the vehicle's new hydro engine mount system which helps to eliminate shake from the interior. To ensure the improved ride comfort and stability applies whether the vehicle is lightly laden or carrying a full payload, redesigned spring aids work in partnership with the softer springs to give a consistent ride whatever the load. The all-new Ford Transit Custom will help 1-tonne van customers combat every-day motoring stress with a comprehensive suite of advanced driver assistance features which are shared with Ford's passenger cars. From the latest driver awareness technologies, such as Lane Keeping Alert and Driver Alert, to practical features for city manoeuvring, including Cornering Lights and Rear View Camera, the Ford Transit Custom has the features to help busy drivers stay relaxed and secure behind the wheel. "Ford's latest passenger cars, like the new Focus, have an unprecedented number of advanced technology features," said Dr Torsten Wey, supervisor driver assistance systems, Ford of Europe. "With the Transit Custom, we are offering many of the same innovations, enabling commercial vehicle customers to benefit from increased reassurance and comfort when they drive." The all-new Ford Transit Custom features an innovative digital camera system which supports three driver assistance features. The Ford Transit Custom also provides a wide range of innovative features to help drivers remain relaxed and confident during a busy working day, even when faced with busy traffic and congested inner cities. The all-new Ford Transit Custom offers the lowest running costs in its class. The reduction of whole-life costs was a high priority throughout the vehicle design and development, with key initiatives including innovative measures to reduce real-world fuel consumption, minimised maintenance and repair times, a 12-year anti-perforation warranty, and the longest service intervals in the class. "Businesses of all sizes are under tremendous financial pressure at the moment, so overall cost-of-ownership is a critical part of the purchase decision," said Trevor Simpson, service engineering program manager, Ford of Europe. "We have gone to enormous lengths to engineer the Transit Custom so that its whole-life costs are as low as possible." Low running costs start with the class-leading fuel economy, delivered by Ford's latest global 2.2-litre Duratorq TDCi diesel engine which achieves combined fuel consumption of 6.6 l/100 km (42.8 mpg) and 174 g/km CO2 emissions - a reduction of up to 8 percent on the equivalent current Transit. To help reduce real-world fuel consumption, the Ford Transit Custom offers Auto-Start-Stop on Stage V vehicles, which can cut fuel costs by up to 10 percent in urban driving. Customers can also specify Acceleration Control, an innovative new option which limits the acceleration of the vehicle when it is unladen or part-laden. Field tests have shown reductions in real world fuel consumption of up to 15 percent, depending on the typical driving style; as well as reduced wear on brakes, tyres and other items. The Ford Transit Custom has been engineered to minimise the costs required for both routine and non-routine servicing, through smart design and optimising the requirement for regular maintenance. With the longest service intervals in the class - two years /50,000 km/30,000 miles - the Ford Transit Custom is designed to spend as little time as possible off the road. Under-bonnet access has been improved through the adoption of a new twin-motor wiper mechanism - which also enhances pedestrian protection - allowing service labour times to be reduced on the new model. The engine design has been optimised to reduce the need for early maintenance, and to enable the power unit to use more affordable mineral lubricating oil. The oil is monitored for extreme usage and condition, and if it requires replacing before the service interval is due, a light on the instrument panel is illuminated. The same attention to detail is employed on the brake system, with brake pad wear indicators to highlight when the pads need replacement. These preventative measures ensure that unnecessary maintenance and renewal do not take place during scheduled servicing, saving costs and reducing downtime. In addition, Transit Custom comes equipped with Ford's Easy Fuel system which is designed to prevent the driver mistakenly filling the vehicle with petrol. To help minimise both accident repair bills and vehicle insurance costs, Ford designers and engineers placed great emphasis on protecting the vehicle against typical low-speed city impacts. This included positioning expensive parts of the front bumper systems, body structure and headlights "out of reach". At the rear, a multi-piece rear bumper design is used for cheaper repairs, while the high-mounted rear light assemblies are moved out of the impact zone. An elegant design solution has also been employed to minimise potential repair costs for the side mirrors, which can be vulnerable to impacts in tight city streets. The mirrors integrate the turn signal repeater within the mounting arm, rather than in the mirror housing, so that if the outside of the mirror is broken, the indicator parts do not need to be replaced. Ford Transits are renowned for their popularity on the second-hand vehicle market, resulting in strong residual values for their owners. With its attractive and functional design, and exceptional durability engineered in from the start, the Transit Custom is destined to be another Transit which appeals just as strongly second hand as when new. The Ford Transit Custom also comes complete with a 12-year anti-perforation warranty, with all key underbody parts produced from zinc-galvanised steel. Special attention has been given to the most vulnerable component areas, with extra galvanising on the front steps, side steps, underbody longitudinals, cross-members and rear wheel housings. Corrosion protection is further enhanced by new manufacturing processes, with the application of cavity wax now completely automated. Ford's all-new Transit Custom has been engineered to deliver the same legendary standards of toughness and reliability that customers have come to associate with the Transit brand. From rigorous computer-based simulations, through Ford's ultra-stringent commercial vehicle test regimes on test rigs and proving grounds, to real-world trials with hard-working customer fleets, the new model has been repeatedly pushed to the limit and beyond. Even before the vehicle goes on sale, it will have been driven the equivalent of 5 million km (3 million miles), including at least 400,000 km (250,000 miles) with Transit customers. "The Transit Custom may look stylish and car-like, but that doesn't mean that we've given it an easier time during development and testing," said Kevin Strutt, supervisor CV durability, Ford of Europe. "The Transit has a hard-earned reputation for bullet-proof reliability, and we're confident the new model will follow in the same tradition." The new Transit Custom has been engineered to meet the toughest standards for quality and reliability, with durability targets which are based on worst-case customer vehicle usage, in worst-case road and climatic conditions, for over 240,000 km (150,000 miles) and 10 years in service. Over 40 percent of the body is made from high-strength or ultra-high-strength steels while extensive underbody protection means it comes with a 12-year anti-perforation warranty as standard. The engineering process starts with rigorous analysis of the new vehicle using incredibly accurate computer-based simulation models, designed to highlight potential durability issues very early in the development phase, so they can be swiftly resolved. Part of the process to identify possible real-world issues involves the input of highly experienced Ford engineers, many of whom have worked with Ford Transit customers in the field for 20 years and are able to highlight cases where similar engineering designs have led to durability and quality problems in the past, and are able to propose alternative solutions. Following the computer-based analysis, prototype vehicles and systems are subjected to testing on proving grounds and test-rigs to Ford's ultra-stringent commercial vehicle durability standards, which are many times tougher than the equivalent passenger car standards. The targets are based on real-world analysis of Transit customers to identify the worst-case usage, in a year-long exercise which involved intensive data logging of over 600 vehicles, in seven different markets worldwide, for over 10 million km (6 million miles). The punishing test regime involves at least 30 separate full-vehicle durability sign-off tests which are conducted at Ford's proving ground facility in Lommel, Belgium, where the conditions range from a high-speed oval, through the toughest rough roads and cobble stones with bumps, potholes and kerbs, to corrosive salt- and mud-baths. The most rigorous of all these tests is the "Trailer Tow General Durability" which condenses a 10-year vehicle life into an accelerated test that runs 24/7 for 6 months, towing a fully laden trailer for much of the test. The events and drive routes in this test are correlated to the toughest worldwide conditions, so the vehicle is ready for any global market. Run in parallel with the durability tests are equally punishing "strength tests" which involve driving the vehicles over abnormally high curbs/potholes at elevated speeds. This simulates accidental but real-world conditions such as misjudging a turning and hitting a kerb unintentionally at speed. The Ford Transit Custom has to be tough enough to withstand these tests even when fully loaded. All of these tests are typically run at least twice during the product development cycle to ensure no issues are missed. They are also backed up with numerous component bench and rig tests, to ensure that the Ford Transit Custom is the most reliable commercial vehicle in its segment. Examples of the component testing include the door slam testing: the front doors go through an intensive non-stop regime of 250,000 slam cycles, which is three times more punishing than Ford's equivalent passenger car test. Before the Ford Transit Custom goes on sale, it will have been driven the equivalent of 5 million km (3 million miles) during the testing process. Part of this includes at least 400,000 km (250,000 miles) of actual road usage with experienced Transit customers. These fleet customers are specially selected to give the vehicle an intensive work-out in tough working conditions, so that any important feedback can be taken account of before the vehicle is given its final "OK to sell". The all-new Ford Transit Custom introduces a new level of load carrying ability to the one-tonne van segment with more space, more convenience and a range of innovative new loadspace features. Beneath its stylish exterior, the new model remains completely true to its Transit heritage by offering class-leading load volume, together with a carefully optimised load space that delivers outstanding everyday versatility and practicality. The Ford Transit Custom's unique new loadspace features were developed by Ford engineers following a special innovation project which captured feedback from customers about their needs that are not currently met by one-tonne vehicles. "This may be a more stylish Transit, but it's a more functional Transit, too," said Barry Gale, Commercial Vehicles chief engineer, Ford of Europe. "The additional features we have built into the load space make everyday functions more convenient - so it's easier for customers to do their job." 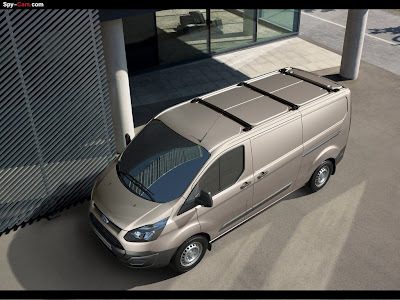 During the development process, Ford designers and engineers gave maximum priority to combining the largest possible load box within the Transit Custom's dynamic and streamlined appearance. Particular attention was given to the detailed design of the bulkhead and bodysides to optimise the size and practicality of the load space. The SWB model is also the only vehicle in its class capable of transporting three Euro pallets with a one-metre high load, which is also not possible in the current SWB Transit. The design of the load box was carefully optimised using detailed CAD models of the load area, and of the items - such as ladders or storage boxes - typically transported by tradesman and professionals, to ensure practicality and convenience in everyday use. The load-carrying capability of the new vehicle has been further enhanced by a number of innovative features which appear for the first time on the Transit Custom. The new features were developed by Ford engineers as part of a special innovation project which allowed one-tonne van customers to provide feedback on additional capabilities which they would value in the new product. Having spent time with customers in their vehicles and listened to their input, the Ford innovation team developed product ideas to address the greatest customer needs. Following further customer reviews, the most successful ideas were developed for final production. The all-new Ford Transit Custom is powered by Ford's latest global 2.2-litre Duratorq TDCi diesel engine to deliver outstanding fuel economy with excellent driveability and refinement. 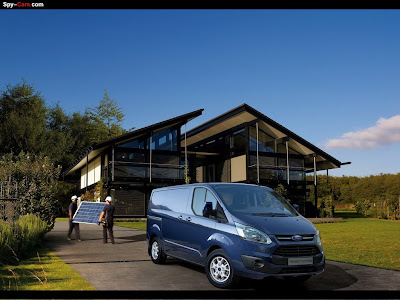 Ford Transit Custom sets a new economy benchmark for one-tonne commercial vehicles, achieving combined fuel consumption from 6.6 l/100 km (42.8 mpg) and CO2 emissions from 174 g/km - a reduction of up to 8 percent on the equivalent current Transit. Engineered with a full complement of Ford's fuel-saving ECOnetic Technologies, including Auto-Start-Stop on Stage V vehicles, the fuel efficiency of the Ford Transit Custom also has been improved through a range of optimisation measures throughout the vehicle. These include more streamlined aerodynamics and the introduction of a dual tyre-pressure strategy, with a special economy setting. "The Transit Custom benefits from Ford's latest 2.2-litre diesel, and we have added further improvements to give customers even greater fuel efficiency and refinement," said Ian Jenks, Duratorq engine programme manager, Ford of Europe. "The vehicle is also packed with fuel-saving technologies, from Auto-Start-Stop to the new Acceleration Control feature, to help keep fuel costs to a minimum." The Ford Transit Custom features an improved version of the 2.2-litre Duratorq diesel engine that was developed to power Ford's latest generation of global commercial vehicles, and launched in the Stage V emissions Transit in late 2011. The 2198cc engine is a state-of-the-art design, developed to deliver outstanding fuel economy, performance, refinement and reliability while meeting strict Stage V exhaust emission requirements. Key design features of Duratorq diesel include a high-strength, lightweight cast-iron block, a higher pressure (1800 bar) common rail injection system with eight-hole Piezo injectors, a lower compression ratio (15.5:1) for enhanced combustion efficiency and reduced emission levels, and a variable-nozzle turbocharger with electronically adjustable vane angles. For the Ford Transit Custom, the engine has been further optimised to improve fuel economy, driveability and emissions. The new model benefits from a completely new engine calibration to suit the unique characteristics of the vehicle, minimising fuel consumption and enhancing torque output and responsiveness. Other detailed improvements include a new air inlet to enhance intake air flow, a larger exhaust gas recirculation cooler to reduce emissions (bypassed from a cold start to accelerate engine warm-up), more precise control of the cooling fans to aid low emissions, new engine mounts, and a shorter exhaust design on vehicles with a bulkhead to reduce weight and improve payload. All Ford Transit Customs are equipped with an efficient and durable driveline that features a six-speed manual transmission and front-wheel drive. The transmission is the latest version of the VMT6 six-speed unit that shares its basic DNA with the manual gearbox available on Ford's flagship Mondeo and offers a truly car-like shifting action. Each ratio has been carefully tailored for optimum performance and fuel economy under all driving conditions, while a new shift mechanism further improves gearshift precision and interior refinement. The generous torque output of the Duratorq diesel has allowed the selection of longer overall gearing, which significantly cuts engine speeds while cruising and helps to reduce noise levels, fuel consumption and CO2 emissions. The Ford Transit Custom is fitted with a dual mass flywheel, which provides a smoother take-up on vehicle launch. Towing, hill starts and heavy load moving are also made easier thanks to a clutch with a new dual layer lining that is the largest diameter (258mm) in the segment for extra durability under harsh operating conditions. The all-new Ford Transit Custom is engineered to deliver outstanding occupant protection, as well as being carefully developed to reduce the risk of injury to pedestrians. The new model is the first Transit to feature ultra-high-strength boron steel in its structure. High-strength and ultra-high-strength steels account for more than 40 percent of the body. An enhanced restraint system gives customers the option of specifying curtain airbags for the front seat occupants for the first time. Among its other safety innovations, Ford Transit Custom is also the first new vehicle in its segment to have been developed with consideration of the latest Euro NCAP Protocol for Heavy Vehicles, which sets tough new standards for the assessment of vehicle safety in this category, including pedestrian protection. "As the recent 5 Star rating for the new Ranger pickup shows, Ford sets exceptionally high safety standards for its commercial vehicles as well as its passenger cars," said Jörg Reim, manager for Analytical Attributes - Body Durability, NVH & Safety, Ford of Europe. "With its all-new, state-of-the-art body structure and restraints technology, the Transit Custom is engineered to deliver outstanding protection. "We also have broken new ground for one-tonne commercial vehicles by introducing comprehensive pedestrian protection features with the new Euro NCAP HV protocol firmly in mind," he added. 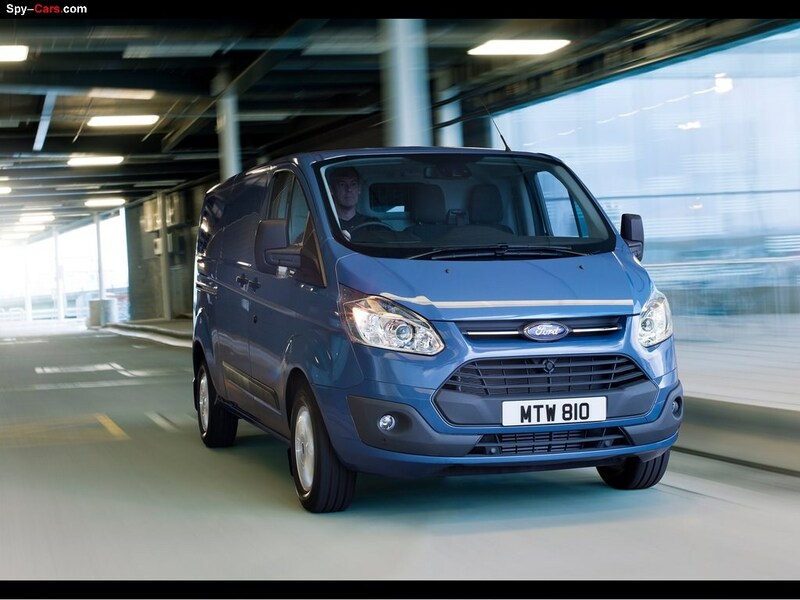 To maximise occupant protection, the Ford Transit Custom features an optimised body structure that features ultra-high-strength boron steel for the first time on a Transit. In total, more than 40 percent of the body is made from high-strength or ultra-high-strength steels, resulting in a strong and light body which is designed to offer high levels of crash protection. Engineers have applied boron steel in the A-pillars and B-pillars, as well as in the structural members beneath the cab floor which help stabilise the passenger cell during an impact. To optimise the design of the body crash structure, Ford engineers carried out more than 4,500 detailed computer simulations of the full bodyshell, covering all of the key crash modes, before validating the performance in 30 full-vehicle physical crash tests. The Ford Transit Custom is equipped with an enhanced restraint system that now makes curtain airbags available for the front seat occupants, in addition to driver and passenger airbags and seat-mounted side thorax airbags. The activation of the airbags is more accurate and controlled thanks to an additional crash sensor positioned near the front grille that works together with the main airbag sensor, which is now located in the centre of the vehicle under the cab floor. As on Ford's latest passenger cars, a non-axial stroking steering column is also now fitted, to help reduce loads on the occupant's head and chest in the event of a high-speed frontal impact. All seats in the Ford Transit Custom are fitted with integral three-point lap and shoulder style seat belts, with pre-tensioners and load limiters as standard on the outboard front seats. The Ford Transit Custom sets new standards in its class by being the first new one-tonne commercial vehicle developed with the latest Euro NCAP Protocol for pedestrian protection in mind. The new model is engineered with a comprehensive range of features in the front end of the vehicle which are carefully designed to reduce the risk of injury to pedestrians, focusing on the design of the bumper and bonnet, the front structure, and the layout of the engine compartment. Like Ford's latest passenger cars such as the Focus, the new vehicle adopts a new dual motor windscreen wiper system, which allows the main elements of the motors and wiper mechanism to be moved away from the centre of the vehicle. Other features include a bonnet with an interior structure produced in a "hexagenous" energy absorbing pattern, a front bumper with an additional deformable fascia element that is designed to help avoid lower leg injuries, and a "soft cowl" and collapsible instrument panel structure carefully engineered to reduce the effect of head impacts at the base of the windscreen by minimising hard contact points. Featuring a broad range of smart new technologies shared with Ford's latest passenger cars, the all-new Ford Transit Custom enables commercial vehicle customers to become more connected, more secure and more comfortable. The Ford Transit Custom offers innovative features including Ford SYNC with Emergency Assistance, class-leading vehicle security systems, and a comprehensive selection of comfort and convenience items. "One-tonne van customers increasingly expect to find the same features that they enjoy in their passenger cars," said Barry Gale, chief engineer commercial vehicles, Ford of Europe. "We have delivered exactly that, with smart technologies that help the Transit Custom deliver a superior ownership experience." The Ford Transit Custom is the first of Ford's commercial vehicles in Europe to offer SYNC, the company's voice-activated, in-car connectivity system, which enables mobile phones and music players to be connected to the vehicle, and operated by voice control. SYNC can also read aloud incoming SMS text messages from compatible mobile phones. It works with a variety of digital music players, including iPod® and USB flash drives. The system automatically updates phonebook entries, while audio files can be browsed by genre, artist, album, song and playlist using simple voice commands. The SYNC system also supports the award-winning Emergency Assistance feature, which is designed to assist occupants to contact the Emergency Services in the event of an accident, providing vehicle location information. Using location coordinates from the vehicle's GPS system, the feature alerts local emergency services operators in the correct language for the region. The most advanced system of its type, Emergency Assistance will be available in more than 30 countries across Europe and beyond. For commercial vehicle drivers spending long hours at the wheel, often travelling in unfamiliar locations, this feature could provide significant additional peace of mind. 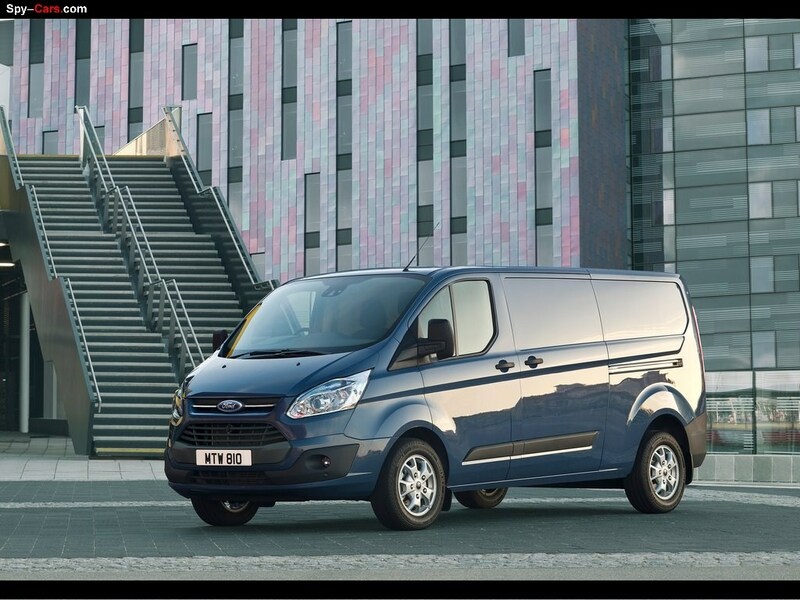 The Ford Transit range has been extensively developed to offer class-leading vehicle security, and that tradition has been maintained with the new Transit Custom. The advanced security systems not only protect against vehicle theft, but they are also designed to secure the load area against break-ins, since many van operators leave valuable equipment or cargo within the vehicle. For added security, the central locking system now enables individual doors to be opened without unlocking the others. Customers may also configure the locking/unlocking settings of the various doors to suit their own operating requirements, by using menus in the instrument cluster display or pressing the key fob buttons in pre-assigned combinations. Other improved security features include enhanced parts marking, with a large range of mechanical and electronic components covertly marked such that they are identifiable to a specific vehicle, and more secure spare wheel mounting. All-new heating, ventilation and air-conditioning (HVAC) systems - two all-new systems are available, offering significantly increased airflow and improved heating/cooling performance, with electronic controls featuring three rotary dials. Customers can specify a standard heater with recirculation, or front manual air conditioning. A separate air conditioning system can be specified for the rear compartment on Kombi models. Other options include auxiliary heaters for the rear compartment, and a programmable fuel fired heater. The all-new Ford Transit Custom features the latest stability and braking technology, providing the driver with added reassurance in all road and load conditions, as well as improved vehicle control in emergency situations. The new model offers a state-of-the-art Electronic Stability Programme (ESP) system as standard, which includes a range of new or enhanced features such as Torque Vectoring Control, Trailer Sway Control and Load Adaptive Control. These technologies significantly improve the vehicle's handling, stability and traction. 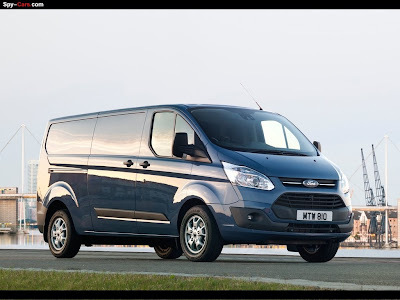 At the same time, the Ford Transit Custom also features a more powerful new braking system with larger diameter discs front and rear, which is designed to offer superior performance when fully laden and a more car-like pedal feel. "We have taken the latest stability and braking systems and have tuned them to suit the unique requirements of one-tonne commercial vehicles," said Guy Mathot, supervisor, electronic stability controls and handling, Ford of Europe. "The capabilities of these systems will give drivers greater confidence and control, whatever the road conditions and whether their van is empty or fully laden. At the heart of the Ford Transit Custom's stability and traction systems is a state-of-the-art ESP module that uses advanced sensors to constantly monitor the vehicle's behaviour, and helps the driver maintain control by applying effective - and often imperceptible - intervention when required. The ESP unit includes a number of new or improved features designed to further enhance handling, stability and traction, and the systems have been specially tuned by Ford's vehicle dynamics experts to suit the typical usage and variation of load conditions experienced by 1-tonne vehicles. 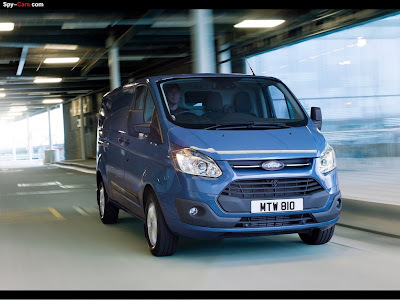 The Ford Transit Custom features a new, more powerful braking system which is designed to improve laden performance and feel, as well as providing increased durability. The front brake discs are increased in diameter by 8mm to improve responsiveness. They are also substantially thicker which, combined with larger brake pads, delivers better fade resistance and longer disc and pad lining life. The rear brake discs are also increased in diameter by 8mm, with larger brake pads. A larger master cylinder and a high output power booster, combined with careful tuning, ensures that the system delivers a more powerful, car-like brake pedal feel, especially in laden conditions. Make money! Don`t waste time! Create your online business with Sellinf.com for only $24,99.